The perfect gift for 5 - 11 year olds who love to Role Play. 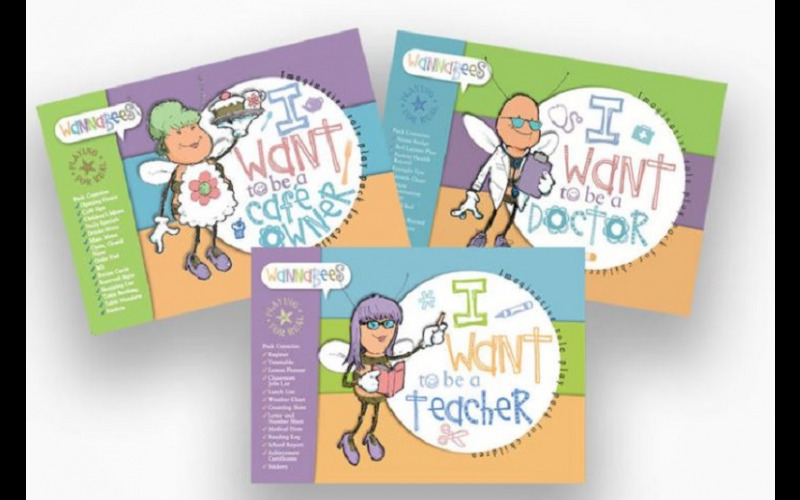 The award winning Wannabees range currently has 'I Want to be a Teacher', 'I Want to be a Doctor' and 'I Want to be a Cafe Owner'. Priced at just £14.99 the packs provide everything a child needs to feel like they are 'playing for real'. All of us can relate to our younger years when we used to spend many a happy hour just ‘pretending’ and that’s why the Wannabees range is perfect for inspiring ‘playing for real’. The award-winning Wannabee Range for ages 5+ provide everything children need to ‘pretend’ to be the profession of their choice. They contain lots of exciting forms to fill in (50 in total), stickers, and certificates that children will need to feel like they are truly ‘playing for real’. Perfect gift for any youngster who loves to role play.